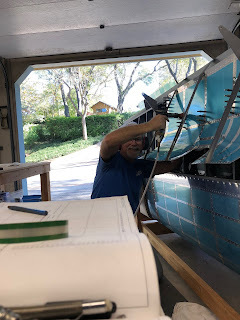 I started riveting the bottom wing skins- fun job... First I tried with the wing laid flat on my work tables, but I could not reach far enough to get the rivets at the trailing edge. Then I put the wing back in the wing stand and from a kneeling position I could make the reach. The rubber mat on the floor helped out the knees. This is one of the more challenging riveting jobs I've done so far so it is going rather slowly.